Inventory We are a resale marketplace, not a box office or venue. Ticket prices may exceed face value. This site is not owned by The Forum . 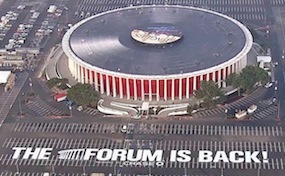 The Forum Inglewood has had a great history and with the recent acquisition by Madison Square Garden the future is looking up. For nearly 30 years the LA Forum was the home to the Los Angeles Lakers. Not only known for sports the Forum has quite the history of musical performers. Some of the past great concerts have included Three Dog Night, The Jackson Five, Led Zepplin, and Barbara Streisand. With all of the history in the Great Western Forum and a new infusion of capital via MSG there will be many more concerts and events scheduled here. ArenaInglewood.com is not a primary vendor, supplier, or affiliated with any official website. We proudly provide access to a wide selection of al secondary market events. Ticket prices may be well below or above face value and will fluctuate with the market. To purchase tickets for all The Forum Inglewood Events simply click on the show of interest or call our operators at anytime.